Many of the benefits of reading non-fiction books with children are right on the surface. Children are exposed to labels, timelines, charts, and graphs. A non-fiction book teaches new vocabulary and concepts. Additionally, children are encountering material that is similar to what they have or will experience in reading textbooks in school. I view all these benefits as secondary to a non-fiction book's ability to spark a meaningful conversation between an adult and a child. My children love checking out beginning-reader-books at the library. My son will find easy-readers about Star Wars and super heroes. My daughter will find more advanced readers about fairies and princesses. This week, I searched the library for many of Seymour Simon's See More Readers books -- Big Bugs, Amazing Aircraft, Emergency Vehicles, Cool Cars, Danger! Volcanoes and Knights and Castles. Many of these books became favorite choices of my children for before bedtime reading. As I read to them, they would stop me on just about every page to make a comment or ask a question. It was as if my children were trying to outdo each other with their knowledge. Often, I was able to add a story about current event or an experience that I have had. My wife was surprised by the conversations I was having with my young children and said quite a few times this week, "What were you guys talking about up there?" One time I responded "Deep-sea robots." We talked about the important role that deep-sea robots played in the BP Gulf oil spill. My children were nodding as if they understood that deep-sea robots allow us to do tasks underwater that divers are unable to do. Then my son said, "Dad, scuba divers CAN go to the bottom of the ocean. If there is a fire down on the bottom of the ocean, the scuba divers will go down to the bottom and say, 'Stop, Fish!' (he emphatically puts his hand up in the air) and then put out the fire. Then, the fish are safe." I think that statement by my 3-year-old son was a combination of a few non-fiction books we have recently read -- volcanoes and emergency vehicles. It shows that he is trying to connect all the information that he has learned through reading and conversing about the books. After this week I am making a commitment to having at least one non-fiction book as a part of our before bedtime reading. In addition to all the obvious benefits, the books will continue to strengthen my bond with my children that has grown through our routine for reading. I had the pleasure of meeting Seymour Simon, "The Dean of Science Books for Children" (NY Times) who has written over 250 science books, and his wife Liz Nealon at the Mazza Museum Summer Conference in July. It was an inspiration to observe their passion for helping children understand their world through quality books and various media (website, apps, blog, e-books, etc.). 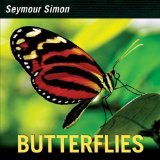 This month Seymour Simon will be releasing his new book Butterflies on August 23, 2011. I am so excited that Seymour and Liz are providing a chance for one lucky reader of Happy Birthday Author to win an autographed pre-release copy of Butterflies! I also wanted to join in the fun and will be giving away the very popular iPad App, Why Do Puppies Do That? by Seymour Simon, to one additional lucky reader. Complete the form below for your chance to win! The contest will close on Tuesday, August 16, 2011 and the winners will be announced the following day. 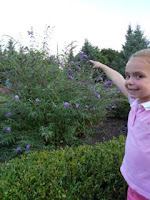 Congratulations to Mary S. for winning the autographed Butterflies book and to Cheryl T. for winning the iPad App. 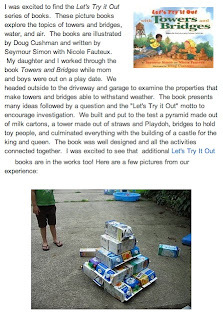 This week my children and I also celebrated Seymour Simon's birthday with the book Let's Try it Out in the Water. 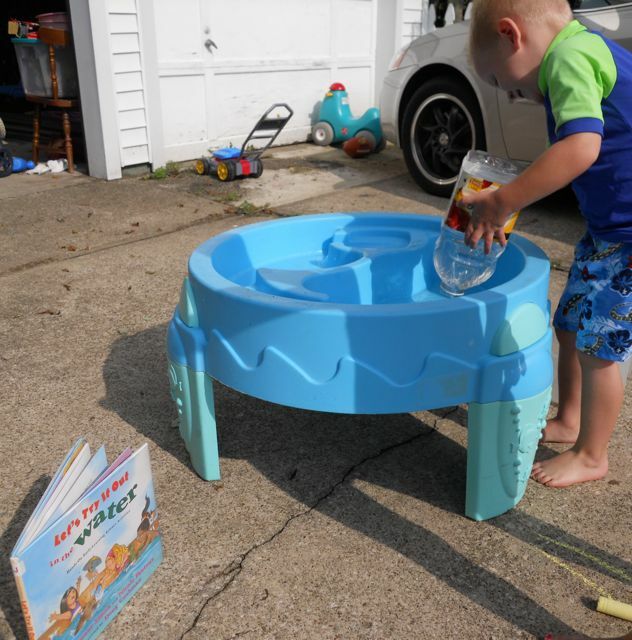 This book walked us through a series of experiments that were very appropriate for my children. 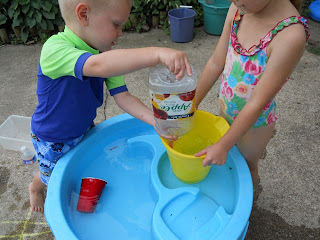 In the first experiment they guessed that it would take 9 or 10 juice containers full of water to fill their water table. They tested their hypothesis and concluded that they were exactly right! They then took their tallest and widest containers to find out which held the most water. In this case the wider, yellow pail held two containers full of water from the tall juice bottle. We learned that a taller bottle doesn't always hold the most water. 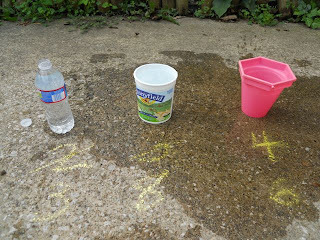 In this experiment we picked 3 containers, hypothesized how many yogurt cups of water would be needed to fill each container. We wrote our predictions with sidewalk chalk. We tested our guesses and wrote the results under each. 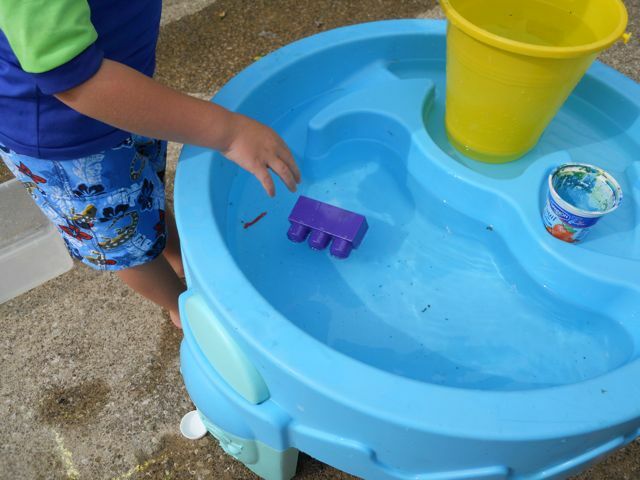 We also tested the floatability and sinkability of many of our toys. Their favorite experiment was making an aluminum foil boat for one of the toys that otherwise would have sank to the bottom of the water table. If you enjoyed this year's Seymour Simon birthday celebration, please check out last year's celebration where we read another book from the Let's Try it Out Series. Click here to view last year's post that also includes lots of information about Seymour Simon, a personal story from the author, and lots of great links to other resources. Pre-order your copy of Butterflies today on Amazon! Eric, you not only talk the talk, you also walk the walk. 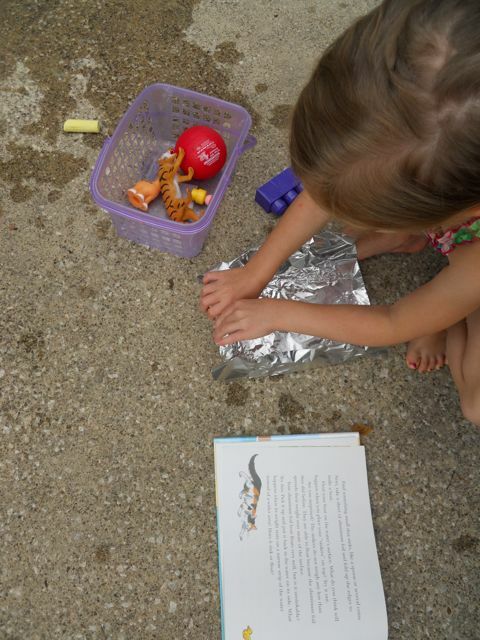 It's inspiring to me to read how you use my books with your children. You make me want to write more and more books about all kinds of fascinating things happening in the natural world. Thank you for your terrific blog!